Wire & ColourCraft Tools showcase different kinds of beading materials. Each tool varies from designing to creating pattern sheets, shaping and flattening beads, sculpting wire and enlarging and rounding-out bead holes. 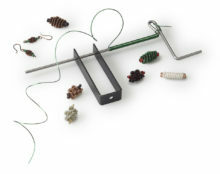 Wire & ColourCraft Tools range from Coiling Gizmo to Chasing Hammer, Beadalon Bead Reamer to Jump Ring Tool.